HMS Prince of Wales had a short but eventful career. It was completed 31 March 1941, by Cammell Laird. It was one of the King George V Class of British battleships designed to the constraints of the London Treaty. On 24 May 1941 Prince of Wales and the battleship HMS Hood engaged the German battleship DMK Bismarck in an historic naval engagement in which Hood was sunk and Prince of Wales was damaged, but not before Prince of Wales struck Bismarck with three of her 14" shells. Prince of Wales was repaired and subsequently transported British Prime Minister Winston Churchill to Ship Harbor, Placentia Bay, Newfoundland to meet with President Roosevelt for the Altantic Conference from 9-12 August 1941. Prince of Wales was subsequently sunk while in defense of Malaya on 10 December 1941 by Japanese aircraft in the South China Sea. Churchill was to sadly note in his memoirs that half the crew of Prince of Wales that attended the rendezvous with USS Augusta for the Atlantic Conference would die within the year. When you get the kit, you will say to yourself, "This is the Airfix kit in a slightly different box", and you'd be right. Frog basically reboxes a few other kits and since they are based in Singapore, it is only natural that they concentrate on items that are significant to their area. This includes the Prince of Wales as it is in that area of the world where she met her demise at the hands of Japanese naval aviation in 1941. The kit itself is really very nice. It is full hull and comes with a stand, though I'm sure it would be easy to make a waterline model if one so desires. The mold must be in excellent condition as this kit is very nicely done. Only a teeny bit of flash around a few parts, and I found but a few ejector pin marks that will be visible, most of them being in areas that will be hidden once the kit is finished. There were only a few sink areas, and again, those will be either invisible when done or easily fixed. The instructions are basically the Airfix ones with addendum sheets added. The cover sheet is a pretty complete history and offers some information on doing kit modifications if wanting to build her as she was in her last days. The kit as boxed is in the fit of the time of the Bismark engagements. The ship shows external degaussing cables on the hull which needs to be carefully removed as this was internally fitted. A color guide is also given using Humbrol paints as a reference as well as their standard names. A superb set of painting guides showing the Admiralty First Disruptive Scheme of 1941 is included for the modeler that wants to model her following her refit after the Bismark mission. It is a lot more interesting than her previous solid grey scheme. No decals are provided or needed. It is great to have this important ship issued and available to modelers. 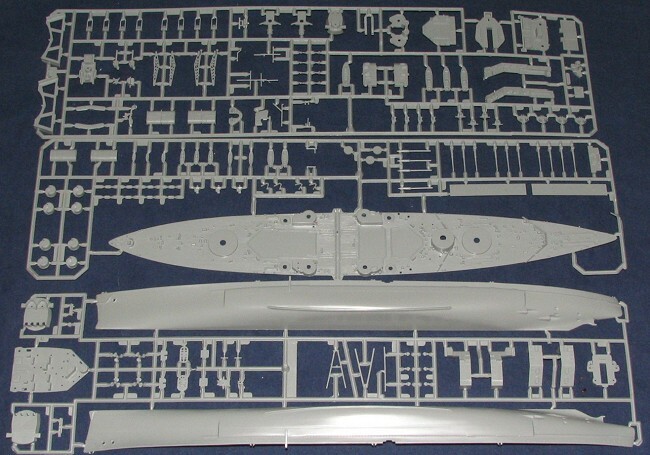 These older Airfix ship kits are still very nice to have and make into superb models. There is photo-etch available from the accessory folks to add even more detail to an already well done model.